Rose was, of course, speaking of quantum computers, but that sentiment is just as relevant in manufacturing. When Alignment Services of North America (ASNA) began using laser trackers and 3D modeling software, the company and its customers began to discover how much more they could do with a 3D survey compared to precision optics. 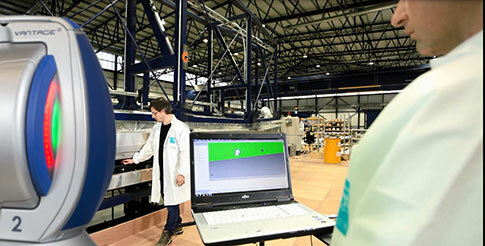 Image 1: ASNA’s 3D metrology team uses extremely accurate, portable coordinate measuring machines (CMMs). A theodolite is a precision optical instrument, in use since the 16th century, that measures angles in horizontal and vertical planes. During the second half of the 20th century, advances in optics technology and manufacturing quality made the theodolite the de facto tool of choice for aligning large machine rolls, gears, and motors—until the emergence of 3D laser tracker technology during the past few decades. New tools are needed for the technicians tasked with alignment and survey duties to overcome the inherent limitations of optics. One tracker that ASNA chose is the Vantage Laser Tracker from FARO Technologies, the world’s most trusted source for 3D measurement and imaging solutions. With 160 m (525 ft) of spherical working volume, the FARO Vantage has reinvented high-accuracy, large-volume measurement. The Vantage provides tremendous value in a complete laser-tracking solution that offers portability, accuracy, and great shop-floor durability. Entire roller systems sinking into the earth is definitely bad, but misaligned parts are no small thing, either; misalignment is going to cause premature wear and possibly catastrophic failure. No matter what industry you are in, machine failure due to misalignment and resulting wear is going to be expensive at the very least. At worst, employees could be injured or even killed. “Another thing that reveals trends is the capability to track measurement over time,” says Dodd. “We can set up an equipment nest, or in survey terms, a monument where we affix a tracker mount to a fixed structure that doesn’t move, and come back periodically to compare current data to past data and see where trends are developing. Image 2: The FARO Vantage tracker provides users with accurate 3D data in real-time. To maximize the capability of its FARO Tracker, ASNA chose BuildIT 3D metrology software. BuildIT Desktop is a CAD-to-part inspection software that enables quick and easy dimensional verification of manufactured parts and assemblies for tool building, assembly, alignment, process automation, reverse engineering, and quality control. BuildIT’s advanced analysis and reporting capabilities combine measurement data to produce detailed graphical and textual reports that are used to quickly identify manufacturing and production trends. 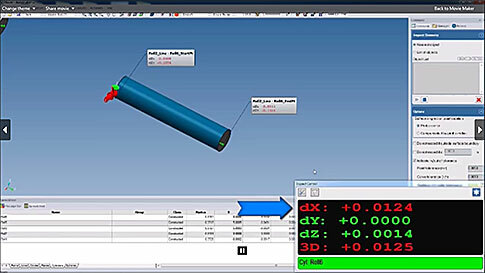 With both numerical and graphical feedback of real-time deviations, BuildIT allows users to position parts with micrometer accuracy for high-precision assembly and alignment applications. 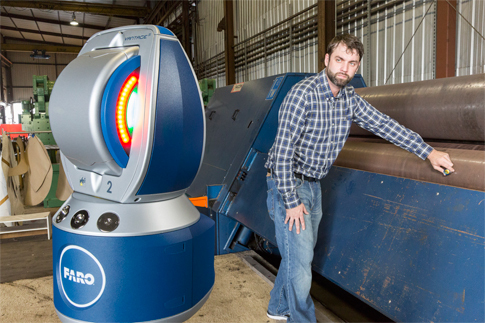 “With the FARO Vantage, we’re able to take a 3D measurement of an entire segment of a machine, and the BuildIT software then allows us to relate everything we do to whatever point of reference or part the customer wants us to,” explains Dodd. “They may want to know where everything is, in terms of height, length, and elevation, relative to roller A. We’re able to do that much more efficiently and in a timely manner now. It almost seems like the FARO Tracker and BuildIT software were tailor-made for our industry. Image 4: The BuildIT desktop program displays the data collected with the FARO Vantage tracker in a textual manner. Customers can see visually what is being explained verbally. FARO, coupled with BuildIT, make data timely and configurable so that customers and ASNA are co-creating new questions about their machines as systems, and new ways to use the technology to provide answers. “You may have a customer that wants to know a measurement from point A to point B, and what’s the status of a certain part,” says Dodd. “Then distance from point C back to point A—after we are done with our scan. With so much information immediately available, we are able to do that. With the click of the mouse and a few key strokes, we can see reference points as relative to each other rather than to gravity; no need to recalibrate or set up in a different spot. The flexibility of the BuildIT software is a bonus for all interested parties. With this level of 3D survey technology comes a need for training and support in order to realize its full potential. “I interacted with FARO a lot back when I worked in the shipbuilding industry,” explains Dodd. “FARO techs came out to us more than once and provided extensive training. They were also very accessible; we could always get in contact with someone for questions and advice. This article was originally published in Quality Digest. BuildIT 2017 Now Available BuildIT 2017 SP2: Maintenant disponible en espagnol!